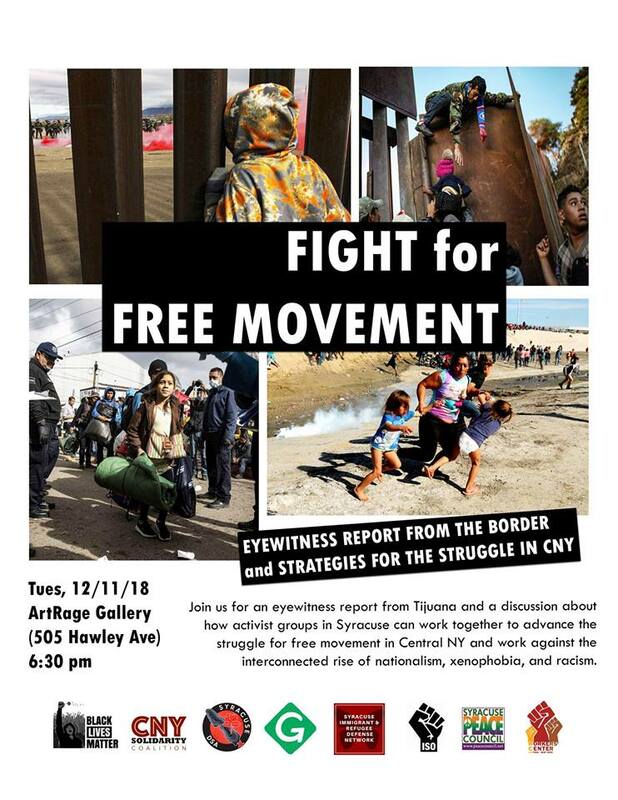 Presented by the CNY Solidarity Coalition, the Syracuse Immigrant and Refugee Defense Network, Syracuse Democratic Socialists of America, the International Socialist Organization-Syracuse, the Workers’ Center of CNY, the Green Party of Onondaga County ,Black Lives Matter Syracuse, New York and the Syracuse Peace Council. Since Trump’s election we have seen the troubling rise of (white) nationalism, xenophobia, and racism manifest in far right politics and in state policy. ICE continues to detain people seeking to exercise their right to migrate and kidnap community members who have long settled in these lands. Thousands of children are still being held in “detention camps,” while migrants at the border are being tear-gassed by an administration that has given the green light to right-wing militias and anti-immigrant vigilantes. The purpose of this meeting is to hear a report from a local activist, Sheila Sicilia, who traveled to work in solidarity with the people gathering at the border in Tijuana. We will also discuss strategies for building the fight for freedom of movement in CNY over the coming year.